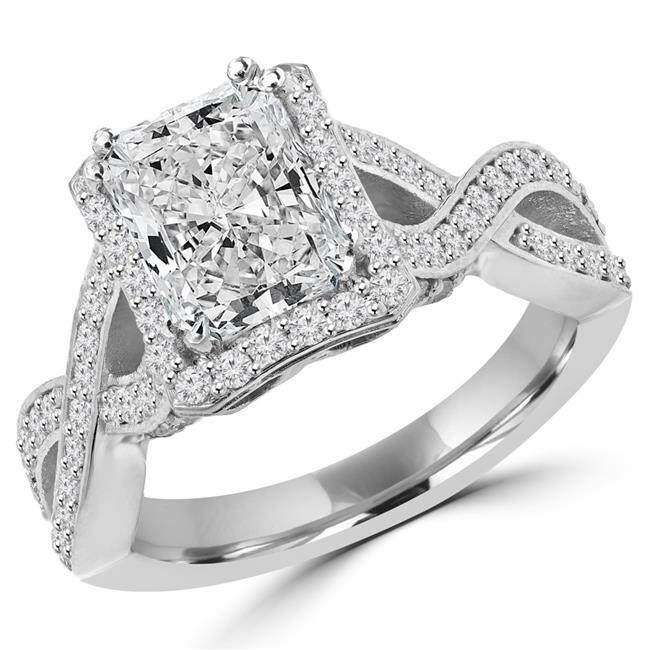 You'll definitely win her over with this gorgeous radiant cut diamond engagement ring. Beautifully crafted in 14K white gold, this ring showcases a 1.51 CT radiant cut diamond center bordered by a square frame of sparkling white diamonds that form a beautifully intertwined shank. Designed to bring happiness and sparkle to her life forever, this stunning ring will leave her speechless. This 1 9/10 CTW Radiant Cut Diamond Halo Infinity Engagement Ring in 14K White Gold features an exquisite infinity band sparkling with over 70 diamonds. All of the diamonds have a very good cut, J-K color rating and SI1-SI2 clarity. What a breathtaking beauty for your breathtaking beauty!